Following extensive pre application formal and informal consultation with local people from July 2011- July 2012 and the support received from Hounslow Council and the GLA, the planning application for the comprehensive redevelopment of the site south of Brentford High Street was submitted in September 2012. At the same time a separate application for the restoration and change of use of St Lawrence Church was also submitted. 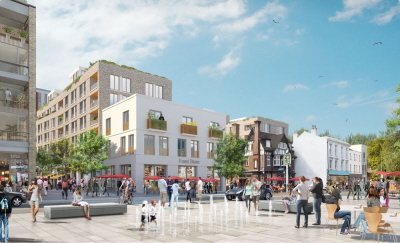 In a recent exhibition on the High Street where the scheme submitted for planning was on display – 78.4% of people who sent back formal responses to the Council said they supported the Masterplan. There remains as has been all along strong support from the local community in respect of the desire to see the regeneration of Brentford Town Centre; the opening up of the site providing access to the river; the positive re-use of the Church and the integration of existing buildings into the scheme where possible. A full summary of the feedback from October’s exhibition can be found below. The Council supports the principles within the Masterplan and Ballymore are working closely with them to progress the application towards a decision early in the New Year. The planning application comprises an outline masterplan for the whole site plus a detailed application for the first phase of development comprising four blocks including the church. There has been much discussion regarding the buildings that form part of the Phase I element and in particular Plot C, designed by AHMM Architects. Following further detailed discussions with officers at Hounslow and key local stakeholders amendments are being explored to Plot C and the masterplan generally. The revised proposals will be on display and presented at the public meeting on the 21st November (for further details read below). The proposed changes to the application will be presented by the developer, Ballymore and their consultant team at a public meeting, hosted by the Council, on the 21st November at St Paul’s Church, Brentford. There will be a drop-in exhibition from 6.00pm to 7.00pm with the meeting commencing at 7.00pm and concluding at 9.00pm. A public exhibition of the planning application documents was held at the Docking Station, 108 High Street, Brentford on 2nd, 3rd, 6th and 8th October 2012. There were 185 registered visitors to the exhibition and 32 formal feedback sheets completed and sent directly to the Council. 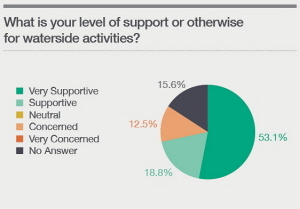 The pie charts below show the responses to the individual questions. 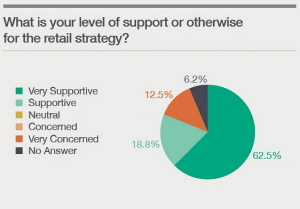 The combined supportive and neutral responses for questions 1-7 are all above 50% with the majority above 70%. What people like: What people most like about the scheme is the improvements to the retail, inclusion of leisure and cultural facilities including waterside activities, street cafes, as well as the way Brentford’s unique history has been acknowledged and how the scheme will improve the image of Brentford. People think that the use of varied height and materials is a good idea and like the grocery store block for these qualities. The taller block on the waterside also has received positive feedback in terms of design quality. Concerns focus on design: Most concerns around the scheme relate to density and design – the need for more variation, less height on the High Street, more information on detail and interest as well as the use of architectural references to Brentford’s historic identity. 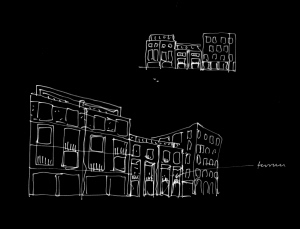 In particular people felt the High Street elevation within Phase I could be improved. Other issues frequently raised relate to levels of car parking and the danger of overspill into surrounding areas,and the need for doctors, nurseries and schools. The support indicated above shows how the masterplan has responded to consultation since the masterplanning process started in July 2011 with major changes amongst others explained and tracked in the Statement of Community Involvement. This is an ongoing process and the team continue to respond to concerns raised post submission of the planning application with significant changes. These are summarised on the following pages and will be fully explained in the public exhibition on the 21st November at St Paul’s Church. A record of the full community engagement and consultation, the ‘Statement of Community Involvement’ produced by Soundings, can be downloaded from the website: www.mybrentford.com, planning application section. The coloured plan on this spread indicates where the proposed amendments are located on the masterplan and in principle what they involve. Further detail and a model will be available on the 21st November at the public meeting to be held at St Paul’s Church. As part of the on-going consultation with officers and the local community, some revisions have been proposed to Plot A behind St Lawrence’s Church and the proposed new fitness centre. It is now proposed to provide more publicly accessible open space within the existing churchyard. This has been achieved by moving a building and reducing its size to create a more open park space. The ground floor of the potential galleried building has been raised to give a clear visual route between Workhouse Dock and Town Wharf and a potential new cultural facility. 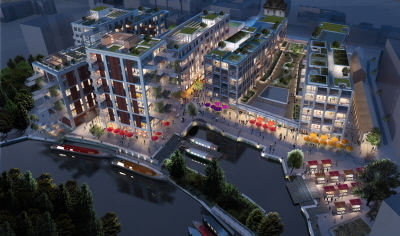 Ballymore are in advance discussions with Cultivate London for an interim use of this site. Cultivate London is an innovative urban farm project that converts vacant land into productive food growing space, generating training opportunities and jobs for unemployed young people and increasing the amount of local and organically grown produce consumed by Londoners. Further design guidance is being provided for the elevation of the car park and specifically regarding the north east corner on the High Street which forms a gateway. Ballymore are considering the potential for a football pitch on the roof of the car park that would be available for youth and community use. More design guidance will be provided as to the architectural expression of this building taking inspiration from the well received Plot K taller building, as well as ensuring that conflicts between the nearby functional boat yard and residential units is avoided. Consideration is being given to a break in the building that would create a less continuous façade and allow more light into the courtyard garden within. Ballymore anticipate submitting separate applications for the use of some of the land within the later phases of the masterplan for temporary car parking to support the Phase I element as well as the town centre in general. This will maintain the agreed ratio through temporary parking until the permanent car parking proposed in Plot G comes forward. The proposals for the site include the comprehensive enhancement of the High Street and works to the Half Acre junction. This will increase highway and bus capacity, introduce the mayors cycle super highway, provide new access and egress to the site and radically improve the public realm by introducing raised tables, a central reserve, and new formal pedestrian crossings. The planning submission included indicative details for the highway layout and this has developed further with agreement from the Council’s Highways & Transportation Officers. The works are intended to come forward early on in the development. The proposed public realm improvements, including provision for parking and bus stops, will be available to view at the community meeting on 21st November.